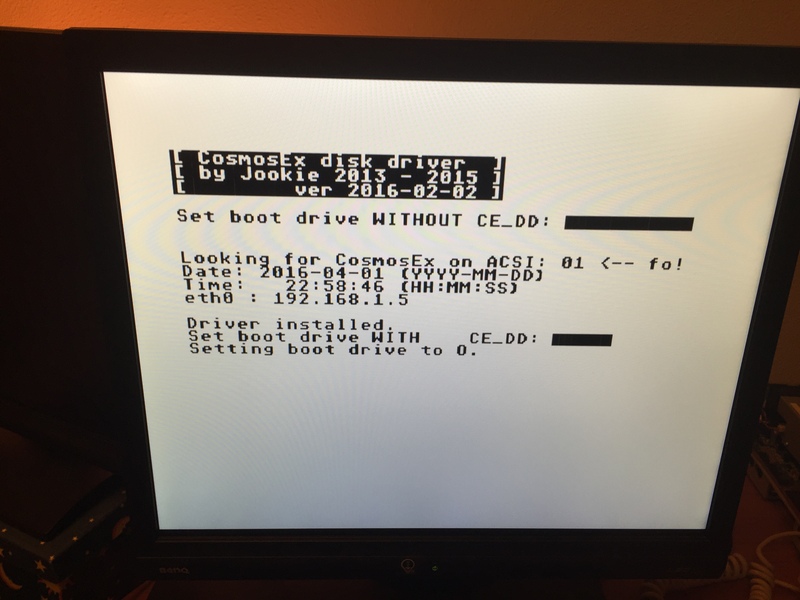 CosmosEX v2 SCSI MegaSTE HELP! I´ve an Atari MegaSTE 4Mb. TOS 2.06 working with an old SCSI IBM HD 1Gb. I want to change my old internal IBM HD for the CE and use a SD card as HD. 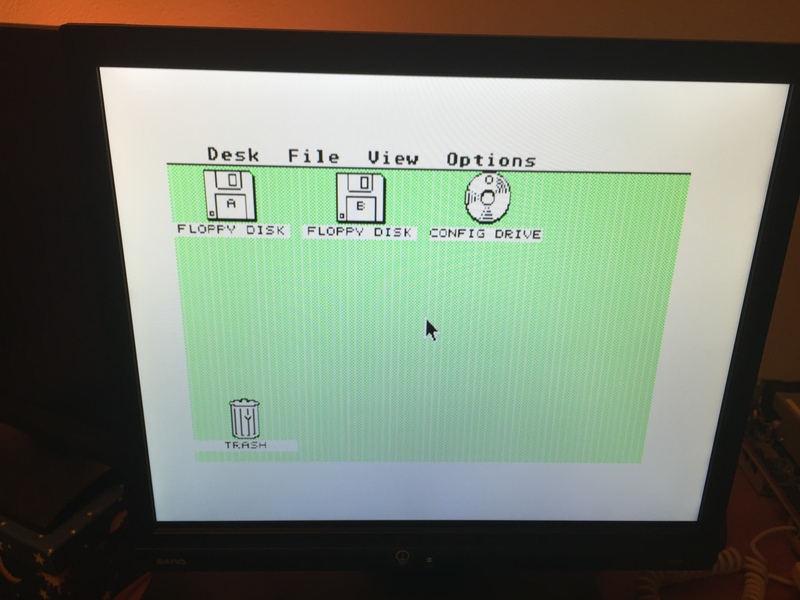 When booted, your Atari should show you a desktop with the drives A,B and O. Open the drive O.
I can see drivers A and B but not O.
Hmm.. 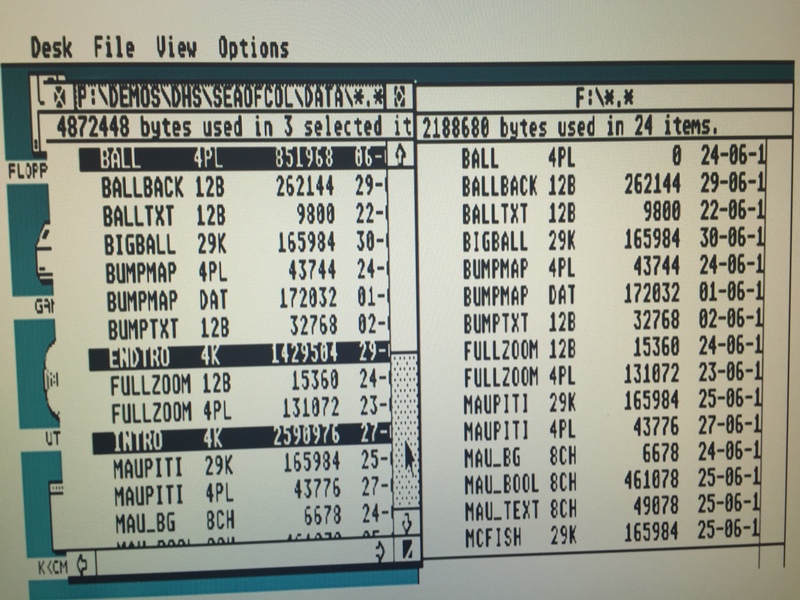 I checked all pass again and seems all the connection between raspberry and cosmos runs because I can upload a floppy from my browser to ATARI and I can see the config from the browser and change the parameters. Also, I´ve read 1000 times: http://info-coach.fr/atari/documents/_m ... _Guide.pdf without results. I change the CE to ACSI mode flashing it with the same results. (I try this, becasuse I read time ago that CE uses SCSI ID:0 and can make a weird conflict with my old SCSI configuration) but the same result. No O: device in desktop. I re-flash again to SCSI and try to change all options in ID config page: no results. I dont know what I can do more. I´m sad. Perhaps it isn't setting desktop.inf properly? Try selecting "Install Devices" from the drop-down menu. I think on TOS 2.06 that's all you have to do, on TOS 1.62 I have to manually enter the drive letter, then name the drive "Config". I only had that happen once, however, not every time like you are seeing. Then if it works, select the drop-down for "Save Desktop"
What ACSI-to-SCSI host adapter you have in your Mega STE? As mentioned in the other thread, it will probably have some issues when sharing ACSI bus with the other device, it could possibly work on SCSI bus, but that might have some other issues. I need to do some tests here during the weekend. I don't have much SCSI adapters in my STs, so there wasn't much testing related to usage of multiple devices on the same bus. One thing which you could try is to disable / remove that ACSI-to-SCSI host adapter from your STE and try if the CE device works fine with your STE then. Well, I think that I cant remove the Hard Disk Controller because in MegaSTE you cant remove it. (If I do that, I will lost the the external ACSI device). Anyway, I remove it and the Atari dont boot. Just four bombs in check memory page! I´ll buy "jumpers" (I need a lot) and I´ll test tonight , putting in the J402 connector. But I see in http://www.lotharek.pl/product.php?pid=92 that this will not enough. Maybe I´ll need buy this Ultrasatan ATARI MEGA STE Adapter from lotharek? The drive must not require initiator identification. Some drives require the computer to have a SCSI ID of its own, but the Mega STE has no full-featured SCSI bus (only ACSI/DMA) and does not provide this feature. You can only use 1 GByte of the drive's capacity, even if the drive has a higher capacity. Parity should be switched off, the Mega STE does not support parity. The drive at the end of the SCSI chain must not be terminated. Terminating the SCSI device can damage the SCSI adapter. The cable to the drive should be short. The SCSI device must be set to SCSI ID 0. ACSI ID is set by DIP switches on the host adapter. so, I decided use cosmos via external ACSI. but... there´re a problem with it. 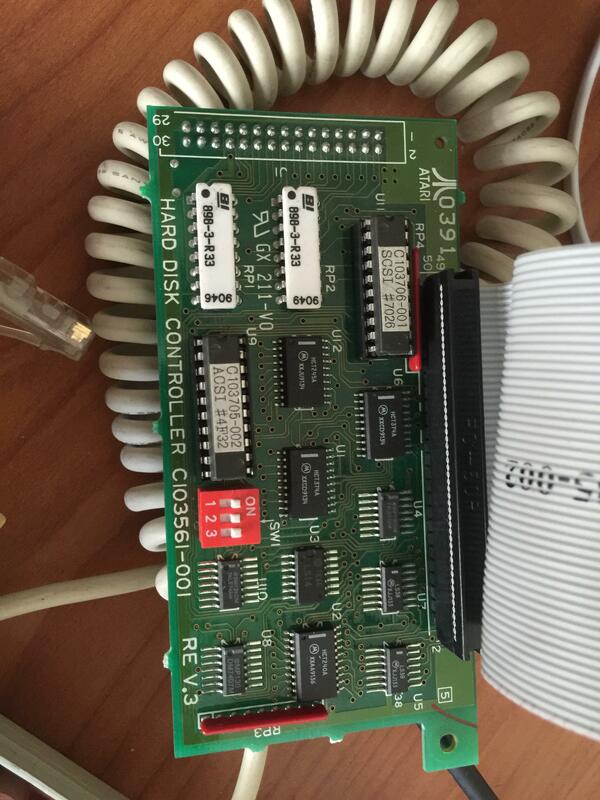 MegaSTE needs the SCSI controller plug-in for that ACSI works. Well, no problem I can keep the SCSI hard disk controller and connect the cosmos via ACSI external. Uhmmm.. Doesnt work.! why? Coz the SCSI use IDE:0 and the CE too !!! so , make it a weird conflict. I hope this help to anyone with MegaSTE. Estrayk wrote: Well, I think that I cant remove the Hard Disk Controller because in MegaSTE you cant remove it. I´ll buy "jumpers" (I need a lot) and I´ll test tonight , putting in the J402 connector. Did you test this one? I wonder if it helped. Estrayk wrote: The SCSI device must be set to SCSI ID 0. This bullet about the SCSI configuration on that adapters seems that it can operate only one SCSI device there (with ID 0), so you probably can't connect CosmosEx there, as it would need another ID on the bus. Estrayk wrote: Uhmmm.. Doesnt work.! why? Coz the SCSI use IDE:0 and the CE too !!! so , make it a weird conflict. Good one The other option would be to change IDs in CosmosEx, which is done purely in software, e.g. through web interface (if you can't connect through ACSI / SCSI at that time). Thank you for this info, it really might help someone else when configuring it with Mega STE. Estrayk wrote: Anyway, I remove it and the Atari dont boot. Just four bombs in check memory page! 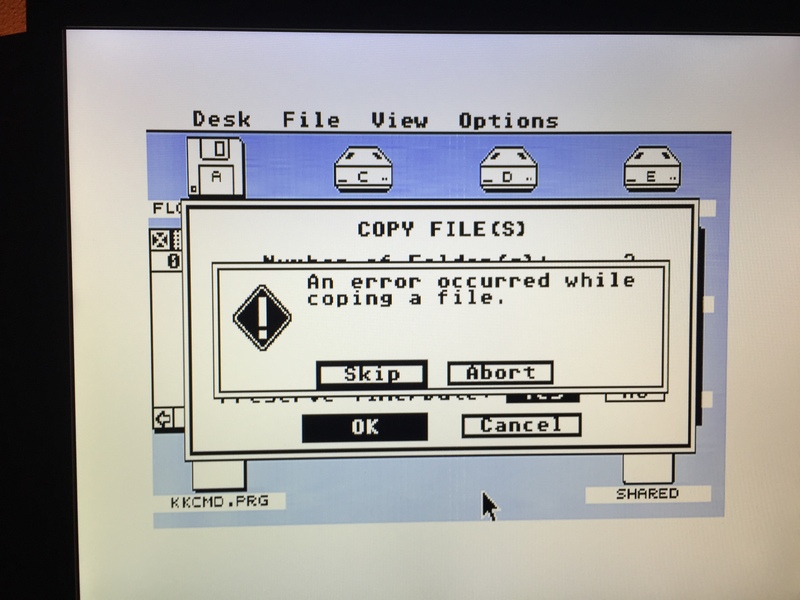 Sounds like you disconnected the floppydrive as well. TOS 2 will crash with four bombs after the memory test is no floppy is connected. There is no reason why a MSTE should bomb when the SCSI-interface is not present. I would think you're right. My STacy doesn't crash with that controller removed and its basically the same board, IIRC. 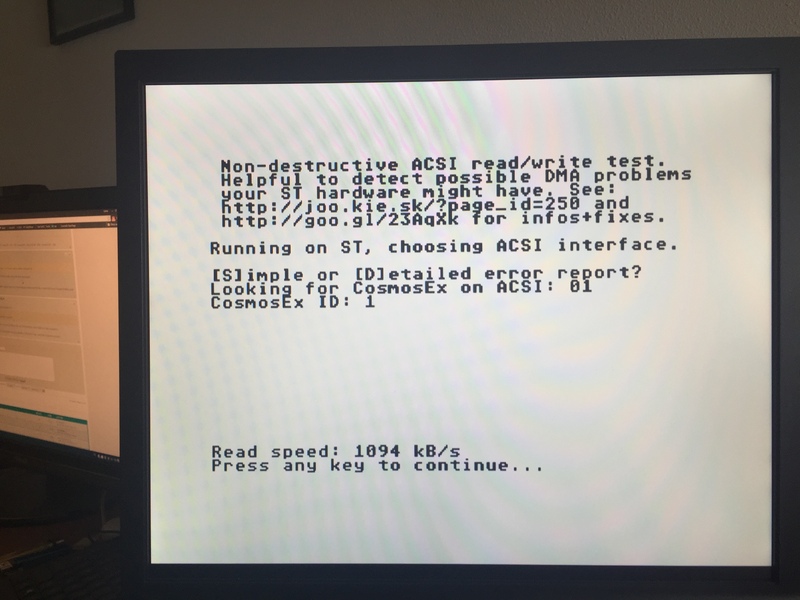 My Atari Mega ST and TOS 2.06 crash with four Bombs when no Harddisk is connected. The only Way is press the Alternate Key at Boottime. Pressing Alternate during booting forces TOS to not load a harddisk-driver and skip all accs/autofolder-programs on your bootdrive. So I suspect the cause for these crashes is some acc/autofolder/harddisk-driver on your boot device. If not, you have a faulty ROM or some hardware-issue. All works fine now! I´m very happy. Anyway... I´ve found a weird problem with ppdriver. when I try to copy files from a partition to another. I think ppera likes to write heavily optimized software, as his driver is both small in size and very fast. Maybe his driver is too optimized for CosmosEx' SCSI implementation? I use CE in ACSI mode. Or ACSI, for that matter The point is that the ACSI/SCSI implementation in CosmosEx might have some timing issues with a highly optimized driver like ppera's. Estrayk wrote: All works fine now! I´m very happy. Anyway... I´ve found a weird problem with ppdriver. 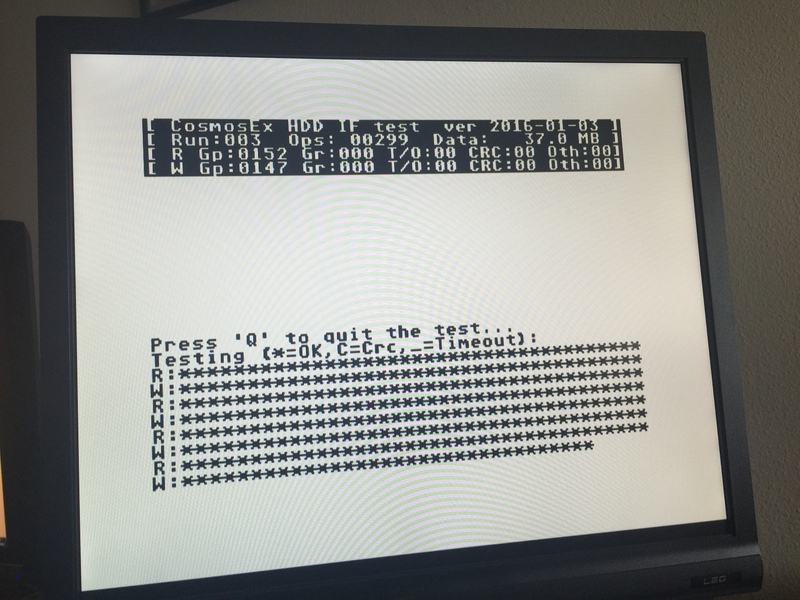 Just for completeness: does the hd test you'll find on the config drive show any hickups? Can you reproduce this with the same fileset reliably? Does it by chance happen at the same file? Big or small files? Does it happen in 8MHz mode also? I simply assumed you meant from SD card (raw) partition to SD card (raw) partition, which might be a false assumption. Did you copy by any chance from/to a translated drive (e.g. network or USB stick)? If yes, what kind of operation exactly? Yes! the same! from Shared folder to RAW SD and from USB (FAT32) to RAW SD, and from RAW SD to RAW SD. When I copy from RAW SD to SHARE (For example) all works fine. so, seems the problem is saving data in RAW SD. tin wrote: Just for completeness: does the hd test you'll find on the config drive show any hickups? BTW, the problem persists in 8Mhz - 16Mhz - 16Mhz+cache. joska wrote: Is that the ACSI/SCSI implementation in CosmosEx might have some timing issues with a highly optimized driver like ppera's. I´ll ask Petari about this issue. Maybe he knows whats the problem. Petari told me that I test it with another SD. Seems Kingston suxx. All works perfeclty with Sandisk. 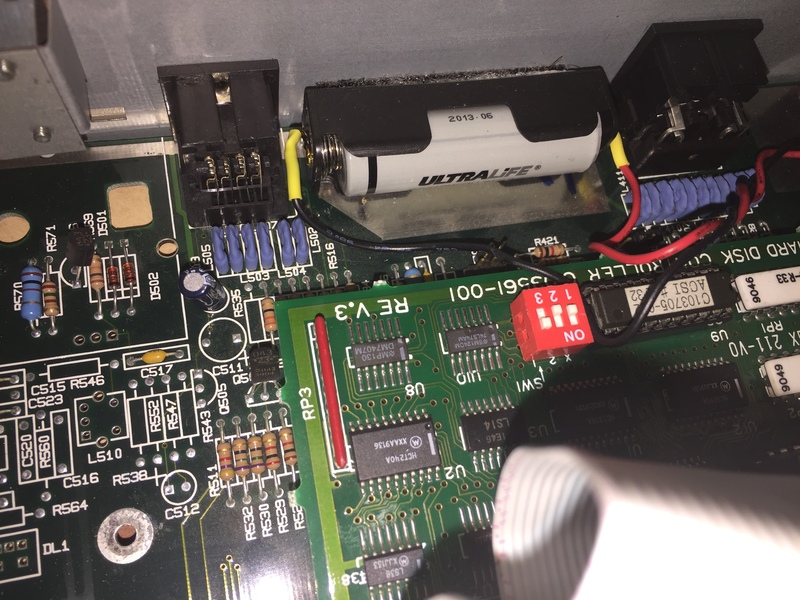 So Marakatti are you running it with an internal Asci drive? or you just wanted to set the jumpers so as not to conflict with your Cosmos? I have mega STEs and I leave the controller in, but I have no HDD on it. all three of my switches are in the ON position, and working fine. Bikerbob wrote: So Marakatti are you running it with an internal Asci drive? or you just wanted to set the jumpers so as not to conflict with your Cosmos? So i can only play Peter's hard disk adaptions but can't use it as a workhorse anymore... USB drive works great but i haven't found a way to to use it as a boot drive. If i remove the internal controller, my MSTE can't see nothing on external ACSI bus either. Marakatti wrote: If i remove the internal controller, my MSTE can't see nothing on external ACSI bus either. I assume you are using Sandisk and not some generic card?? Sandisk works for SURE! I have gotten other stuff to work, but it is slower. before you give up on the CE.. check that. Use a card everyone knows works.. aka Sandisk. Thanks Will check this later today. Is there a guide to rest of the jumpers. Is it possible for example to force MSTe to boot 16Mhz instead of 8? Bikerbob wrote: I assume you are using Sandisk and not some generic card?? Sandisk works for SURE! I have gotten other stuff to work, but it is slower. before you give up on the CE.. check that. Use a card everyone knows works.. aka Sandisk. Local markets don't sell SanDisk SD cards here. Only Kingston, Transcend and Integral. I loaned Lotharek's ICD prepared SanDisk card from a friend and it indeed was more reliable. Need to order one for myself. Transcend card was corrupted all the time after writing an image with PC. Integral is working ok too, i just can't install Peter Putnik's driver to it. It always tells me there's not enough space on the bootblock. But i can use it to play his adaptions with a driver launched from GEM. I hope there are some coding users who want to improve the drivers. That is really what is needed now. Getting translated disks (USB) to work in a multi tasking enviorment is key. As you say, having it boot. There is a function that if you had an .img on one of the usb - you are supposed to be able to set that up to boot from it, but I have yet to make that work myself.